In my blog post a year back ( http://kvrlogs.blogspot.com/2008/04/rendezvous-with-vista.html ) I had given a favourable review of Vista. Now i take everything back that I said. 1. I have an apple USB keyboard with the mouse attached to it. Every time the machine comes out of sleep I have to wait 1 minute before it gets activated. And yes the year is 2009 and it takes such a long time for Vista to detect a USB device/hub. Good job. 2. BSODs - I see it 2 to 3 times a week. I still have not found a pattern and I do not have any freebies off the net. 3. I am in Bangalore and power goes off frequently. And along with it my internet connection goes off. Mostly I will be connected to Apartment Adda through putty and it will stop responding. The CPU usage will shoot up to 100%. It took a long time before I found this problem. I started suspecting that my machine got infected and ran scan after scan. How did the kernel overlords allow any process to consume 100% CPU - that too a lowly SSH client called putty which is 300KB in size. 4. Search and Indexing is a joke. Microsoft is trying to compete with Google? Good luck. 5. Finally, booting speed. It is as slow as Windows 3.1, Win 95, Win 98, Win ME, Windows XP. Nothing has changed. I have to start the laptop, go brush teeth, read newspaper and drink coffee, wash the cup, read A to Z to my son, and then when I come back it might be ready - or it might have installed updates and restarting. Oh so you recommend trying windows 2007? And I have to pay for it. Naah - I think I have had enough with Windows OSes the past decade. Now I have Ubuntu on the other partition and it blazes - takes full advantage of the hardware that is offerred to it. I am going to format this machine with just Ubuntu in another couple of weeks. Wish chrome is ready for linux soon. Btw, I've never seen BSOD on "my" Vista, but I've seen some on Macs running Vista. i heard you can downgrade vista to xp if you have the original version. ...If im not wrong. Yep that is doable, but I do not have an XP CD. While buying the new laptop I asked XP to be installed but they will not budge. Dell elsewhere lets you choose XP or even choose linux and they reduce the sticker price - not in India. BBMP - The corporate body in charge of Bangalore - which keeps roads pot hole free, streets free of trash, lakes without foam, keeps underpasses dry during monsoon - was able to carve out free time to brainstorm and come up with a new law - to regularize pets. BBMP has put up a list of allowed breeds in Apartment Complexes. 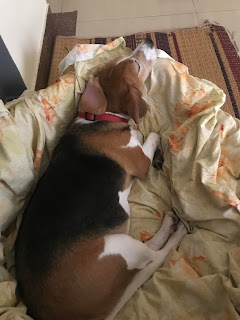 Sufi who happens to be a Beagle is now an illegal immigrant as of today. Sufi, Trump also hates you now. And it is not over - there is a new rule now - only one pet per apartment is allowed. And Indies are not in the list either. Good luck Carbon ( Sufi's friend living in a nearby Apartment ). To tackle pet breeders they justify. I tell this to Sufi and she does a face palm with her cute paws. Today I was listening to Thiruda Thiruda - A.R.Rahman's 3rd movie which whenever I listen transforms me to the slogging days of 12th Standard. However, I was listening to Raasaathi en usuru ennuthilla and remembered the voice - Shahul Hameed - the unfortunate singer who died so young in a car crash near Chennai in 1998 or around that time. I was appreciating the intense song the way Shahul Hameed had song with so much passion and life - I felt sad. How unfortunate - he could have been a great singer with his high pitch and powerful voice. However, he still lives on. 10 years down the line, a soul thought about him. Isn't that wonderful. Very few can leave a mark on the world they lived - it is easy for artists - musicians, painters, singers, dancers, actors,writers. What will people like me leave behind? Anyway, Shahul Hameed - your voice is immortal. Thanks for the great song. This is my translation of Avalum Naanum by Madhan Karky for the movie Acham Yenbathu Madamaiyada. Yet another masterpiece by AR Rahman - the music goes to the background letting the lyrics shine. The movie name means - Fear is foolishness a phrase from a famous old tamil song by Kannadasan. The director of this movie - Gautam Menon, a Malayalee, names all his movie names with beautiful tamil phrases - and hard to pronounce too at times! The song is full of comparisons for She and I. Sounds beautiful if you understand even a little bit of Tamil.